Dickies Medway Boots - Super Safety! 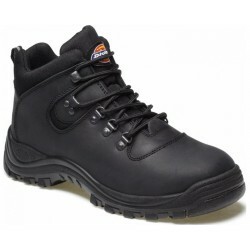 The Dickies Medway Super Safety Hiker Style boots are a very popular safety boot from Dickies Workwear. The Dickies Medway boots come in sizes from 5 up to a 12 and are made from a full grain leather. The boots has lots of great features including being fully approved to EN20345 to 200 Joules protection which is the standard for safety boots impact protection to the toe. The Dickies Medway boots are also anti-static and incorporate a 3M Thinsulate lining within the boots which keeps your feet warm and the brathability keeps them from sweating. A Steel anti-penetration sole unit in the sole protecting you from any puncturing from below such as nails etc. A dual density EVA/Rubber sole which offers a strong outer whilst being soft in the upper side for extra compfort for people on their feet all day. Heat resistant to 300oC - handy for workers working with hot tar on the roads meaning the soles won't melt! Anti-Scuff toe and heel - the unique design of the Medway boots make the boots suitable for tough working conditions as this is the area that normally takes the most punishment! When not in use, store the footwear in a well-ventillated area away from extremes of temperature. Never store the footwear underneath heavy items or in contact with sharp objects. If the footwear is wet, allow it to dry slowly and naturally away from direct heat sources before placing it into storage. Clean your footwear regularly using high quality cleaning treatments recommended as suitable for the purpose. NEVER use caustic or corrosive cleaning agents. A unique safety boot featuring the qualities that have contributed to Dickies reputation in this field of workwear and P.P.E. ; comfort, durability and safety protection. The Dickies Medway Safety Hiker is Thinsulate insulated and water resistant to S3 highest standards. The Medwahy heel is shock absorbent, easing the punishment of working feet on rough ground. These have developed a market far exceeding work usage and are now popular for outdoor pursuits and hiking boots.